Urgent care is one of the most commonly utilized service areas in healthcare, because of last minute minor medical emergencies that happen around the home or outside. Every year, thousands of Americans experience some type of minor urgent care emergency that causes them pain, stress or discomfort. When most families experience these medical setbacks, they immediately rush to the nearest hospital for attention at the urgent care center. Unfortunately, they are often left waiting in a sitting room with other sick or injured patients before a physician is available to help them. In addition, when patients do receive care at a hospital urgent care room, the service is usually rushed and impersonal because of the long waiting lines. At Northwest Ohio Urgent Care, our medical professionals provide a convenient alternative to the Toledo area. We provide walk in urgent care services to the community, all at a state of the art clinic in Toledo. Rather than waiting for hours at a hospital for mediocre care, Northwest Ohio Urgent Care can provide you and your loved ones with great urgent care services from a top notch team of medical experts. Our urgent care clinic focuses on providing timely and friendly care, so as soon as you walk into our clinic you will be helped by a compassionate member of our medical team. We know that your health does not rely on a set schedule, so we offer our urgent care services during flexible hours every day of the week. Our urgent care clinic also provides care to children and seniors, with a pediatric urgent care clinic on site for your child’s health. One of the biggest advantages of coming into Toledo Urgent Care for fast medical attention is our team of medical experts. All of our doctors are Board Certified and have years of experience in emergency medicine and family health care. When you and your loved ones come to our walk in clinic, you will be in great hands. The rest of our medical team provides confidential urgent care services and can answer any questions that you may have about your health and our clinic. We aim to make the urgent care process easier and stress free for everyone involved in a minor medical setback. 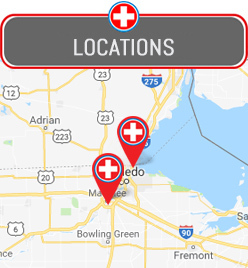 If you have any questions about the urgent care services that we cover at our location in Toledo, please do not hesitate to call us or walk in today for timely medical attention. Our entire team hopes to have you and your family feeling happier and healthier soon at our urgent care clinic in Toledo!